In terms of conveying the social situation of the Meiji period before the proliferation of photography, it can be said that there is no better material than these nishiki-e (color woodblock prints) that depict aspects of cultural enlightenment. This nishiki-e depicting a brick lined Ginza street also conveys well the atmosphere of a new age. The construction of the city of Ginza began in 1872 (Meiji 5), but the present Ginza street was completed six years after this, as shown in the picture. It shows us a part of an all-new city landscape appearing before the people's eyes, previously unseen during the Edo period, and designed to be a model western metropolis with widened and paved roads and brick buildings, as wooden structures were banned to prevent fire. The balcony visible on the second level was also a novelty. In Edo, the building of second story residential buildings was forbidden in principle. Because of this, there were some traders who did take two stoy buildings but only as latticed lofts. 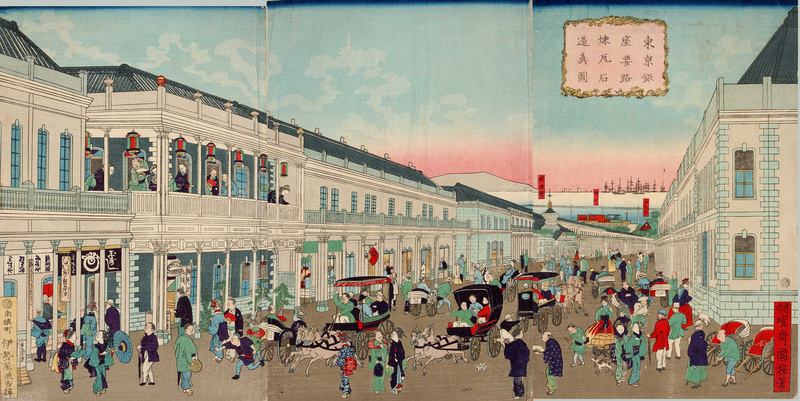 It is probable that the fine view of the town from the second floor was also thanks to the Meiji Restoration.